One of the UK’s leading pipeline pigging specialists – iNPIPE PRODUCTS™ – has successfully completed an integrated seawater inlet cleaning system for a series of inlet pipelines in what is believed to be the largest pigging project in the world. "iNPIPE PRODUCTS completes pig cleaning system for inlet pipelines"
Commissioned by a South Korean conglomerate, iNPIPE PRODUCTS has supplied a first of its kind integrated solution including cleaning tools, loading equipment, launching equipment together with an integrated tracking that will be used on some of the world’s largest pipelines, measuring an impressive 90 in. dia. Speaking about the contract, Peter Fretwell, Director of Pigging Services at iNPIPE PRODUCTS, said: “In my 40 years of experience in the industry, this is by far one of the largest and most technically complex projects that I have ever been involved in. We are delighted to have developed an integrated cleaning and loading/launching system that has never before been created on this scale. The scope of supply to the Algerian power plant, in addition to deploying the 90 in. cleaning tool or pig, included providing pig loading facilities and launching facilities right through to delivering flexible manifold delivery system to accommodate site installation delivery tolerances of +/- 500 mm. 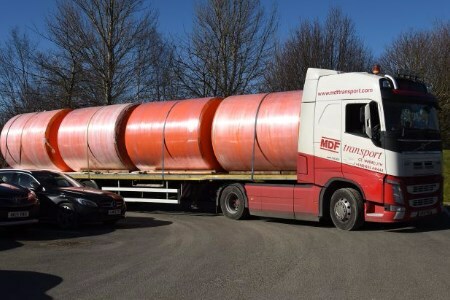 Once the capital plant is delivered, iNPIPE PRODUCTS will further provide technical support and expertise for ongoing pipe cleaning purposes throughout the life of the project. And, in what has been a challenging time for companies operating in the oil and gas sector, iNPIPE PRODUCTS has bucked the trend with its sales growing by in the Middle East and southeast Asia. The company exports 84% of its turnover to six continents worldwide. Simon Bell, Managing Director at iNPIPE PRODUCTS, said: “We are extremely pleased with the company’s performance over the last year. We have systematically improved delivery performance since relocation into to our larger, 60 000 ft state of art facility. We firmly believe that we have showcased our ability to adapt to changing market conditions and to deliver our world-renowned cost effective solutions to any part of the world. The company has ambitious plans to deliver its 90 in. pipe cleaning solution to turnkey suppliers across the world.